The Bamoun, a dynamic race conquered their way from North Africa two or three centuries ago to settle in the high plains of Cameroon. The Bamoun have many attributes, one being highly gifted artisans. Their workings are some of the most elaborate, intricate and lavishly detailed pieces in all of Africa. Only the most superior of Bamoun artists are called upon to create Royal Court art; objects whose function is spiritually connected and utilized only by the members of the Royal family. The object on display is of a Royal bed. This selection is used exclusively by the king when he is faced with a difficult problem or dilemma. It is believed that when he lies down on the bed with problems on his mind that the ancestors will come to him in his sleep and resolve the issues for him. The ancestors are usually carved in a pronounce manner around the bottom of the foundation of the bed and can, when there is a headrest area surround, the pillow" along with other royal court figures such as a lion or spider. 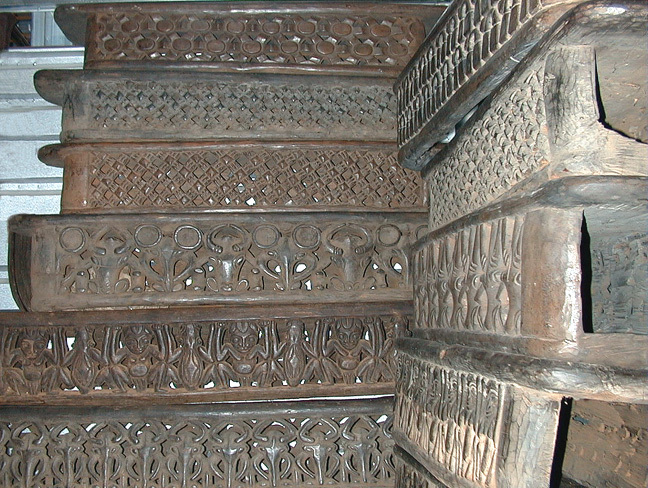 The Cameroon beds are carved from one single section of hard wood. There are many versions of these popular beds. Some have intense woodworkings around the middle such as the lattice bed or the classic spider motif, some will feature human ancestor figures that will surround the bed while others still will sport animal motifs such elephants, water buffalo, lizards or leopards. It is also not unusual to find Royal beds that have been heavily decorated with thousands of tiny plastic beads which cover the carved motifs. When our beds are in supply we carry the full line! This section has temporarily sold out. We acquire beds on a regular basis. For more information or to be notified when more arrives please contact us.